NETfinder is the newest generation of the LANTest family, with an advance circuit design surpassing the original technology. NETfinder is a perfect companion to network professionals and students, for commercial and residential applications. NETfinder is designed to enhance users’ ability to quickly locate and verify the status of common and standard voice and data cables. 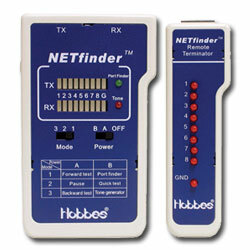 It combines the functions of a convenient cable tester with a built-in low emission frequency "TONE" generator.